A big, and still rising percentage of workers is doing at least in parts mobile business work. From the IT point of view, one of the immediate consequences is the increasing demand for being integrated into the global and corporate network both in case of recording new information and retrieving needed information. new approaches to mobile information and knowledge handling by extending knowledge management to support authoring, sharing, retrieval, and visualisation processes in mobile work. support for mobile co-operative (planning) processes. The official page of this project is located at http://www.mummy-project.org/. 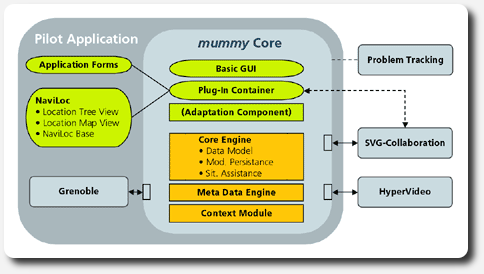 The MUMMY-system meets the needs of mobile workers to capture and access knowledge coherently by an „information-in-context“ approach using multimedia annotation and location / task-related assistance. This project was funded by European Community - IST-2001-37365. A Reference Architecture for Mobile Knowledge Management. Balfanz, D; Grimm, M.; Tazari M.-R. Dagstuhl Seminar 2005, Mobile Computing and Ambient Intelligence: The Challenge of Multimedia, Wadern (Germany), 01.-04-05. 2005. Object based manipulation with 3D scenes in mobile environment. Cmolik, L.; Mikovec, Z.; Slavik, P. Dagstuhl Seminar 2005, Mobile Computing and Ambient Intelligence: The Challenge of Multimedia, Wadern (Germany), 01.-04-05. 2005. XML Visualization Using Tree Rewriting. Jelinek, J.; Slavik, P. in Proceedings of 20th Spring Conference on Computer Graphics SCCG 2004, Budmerice, Slovakia, 22-24th April 2004. Adaptation of Graphical Data in Collab. Environment. Klima, M.; Mikovec, Z.; Slavik, P. in Proceedings of 8th ERCIM International workshop on “User Interfaces for all”, Vienna, Austria, 28 – 29 June 2004. Semantic Information Visualization. Klima M., Halabala P., Slavik P. in Proceedings of CODATA 2004, 19th International CODATA Conference, THE INFORMATION SOCIETY: NEW HORIZONS FOR SCIENCE, electronic proceedings. Multimodal Interface for Data Retrieval during Conversation. in Proceedings of CODATA 2004, 19th International CODATA Conference, THE INFORMATION SOCIETY: NEW HORIZONS FOR SCIENCE, electronic proceedings. A Context-Oriented RDF Database. The first workshop on the Semantic Web and Databases. Tazari, M.R. Berlin (Germany), September 2003.